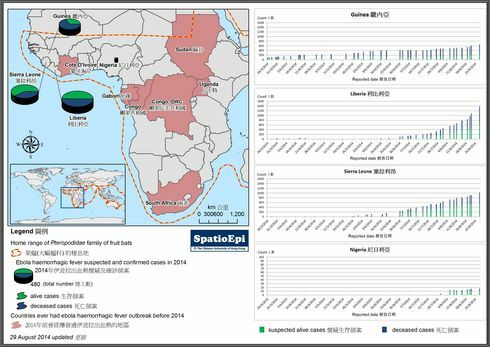 Since March 2014, there has been an ongoing Ebola Haemorrhagic Fever (caused by Ebola virus) outbreak in Guinea in West Africa. By the end of July, more than 600 cases have been reported, including at least 400 deaths, in the country. The neighbouring countries, Liberia and Sierra Leone, have had faster epidemic growth than Guinea. 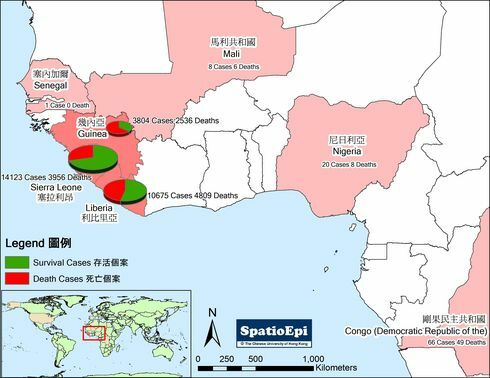 Liberia has recorded above 1300 confirmed and suspected cases, including 690+ deaths. Sierra Leone has recorded at least 1000 cases, of which more than 400 died. At the end of July, Nigeria has its first reported cases, and the number of was more than 10 with almost half of them died within 1 month. The graphs show the cumulative number of reported cases in each respective country since March 2014. 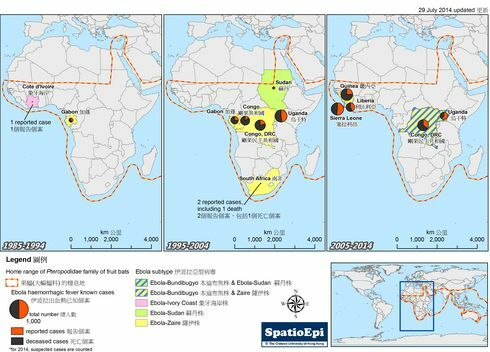 The map shows the home range of fruit bats (possible natural host of Ebola virus). The background colour of countries on the map highlights the places which had Ebola outbreaks before 2014, with pie charts showing the proportion of deceased cases whereas their sizes indicate the total number of reported cases in the respective time period. Ebola virus can be transmitted through direct contacts with blood, secretions, other body fluids and organs of infected animals or human. Infection control in health-care settings and personal preventive measures are essential for controlling the spread of this deadly infection. Data for the map were extracted from WHO and CDC. Ebola haemorrhagic fever, a disease caused by Ebola virus, spreads through wildlife-to-human or from human to human. The main signs and symptoms include fever, intense weakness, muscle pain, headache and sore throat, followed by vomiting, diarrhoea, rash, impaired kidney and livery function. There can be internal and external bleeding. The time interval from infection to symptom onset (incubation period) is 2-21 days. There is no specific treatment available and only supportive therapy is indicated. The case fatality rate is as high as 90%. Ebola virus spreads through direct contact with blood, secretions, other bodily fluid and organs of infected animals or human. Pteropodidae family of fruit bats is considered as possible natural host of Ebola virus. There is no vaccine available for Ebola haemorrhagic fever. The only ways to prevent transmission include infection control in health-care settings, raising awareness of Ebola infection risk factors and personal preventive measures.